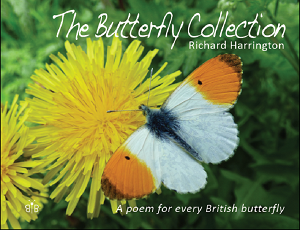 This is the first book to celebrate each of the 58 British butterfly species in verse. The poems mix fact and fun and will be enjoyed by those already passionate about butterflies whilst enthusing others to become so. Brief introductions to the poems explain aspects of the butterflies’ lives necessary to appreciate the poems fully. Many are dedicated to people who have inspired the author in his entomological career. All are wrapped in colour images from life, producing a splendid and enchanting book to be treasured. Has a quite unmistakable flight. But it sends me as high as a kite. Though, frankly, the difference is slight. Through every southern down and wood. The nature of your neighbourhood. For now your situation’s stark. Oh bold and handsome metalmark! Your knights and serfs are on the case. A duchy stretching shore to shore. Whilst lesser species hide away. Bright yellow halos say it all.